HOUSTON–(BUSINESS WIRE)–Global enterprise software innovator ePROMIS Solutions Inc., announced today that ePROMIS ERP has emerged as the top ERP software for the second consecutive time in FrontRunners® ERP software report by Software Advice, a Gartner company. With a total score of 9.86 ePROMIS, ERP is also the biggest gainer in the global ranking, improving its previous score of 9.23. The Gartner company Software Advice releases biannual FrontRunners® reports to highlight top software products for helping businesses evaluate which software products may be right for them. According to the statement by Software Advice, this report is based on a 100% data-driven assessment positioning the top scoring products. 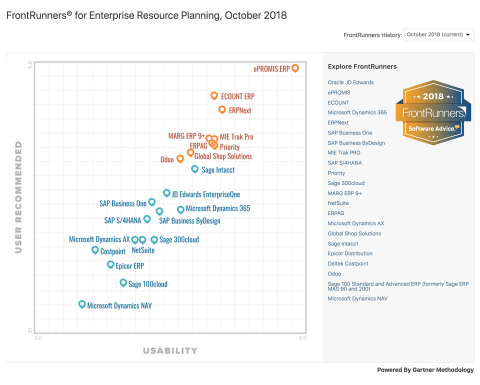 “We evaluated over 195 ERP products, only those with the top scores for usability and user recommended are in FrontRunners list,” says the report. “ePROMIS ERP enters FrontRunners report the fourth time in a row and wins the top position for the second consecutive time leaving the competition behind. We’re delighted to have received this top ranking position again as it confirms our success in providing unique value to our customers,” Mathews Mathew, CEO of ePROMIS observed. ePROMIS ERP serves over a million users worldwide, maintaining the highest rates of customer retention. ePROMIS is a global leader in enterprise software market making significant contributions in driving digital transformation of businesses. The company provides on-premise, cloud and web-based business management solutions to industries including construction & engineering, real estate, oil & gas, manufacturing, and trading. ePROMIS has regional subsidiaries and solution partnerships across the U.S., U.K, Australia, Malaysia, Singapore, Middle East, and Africa.